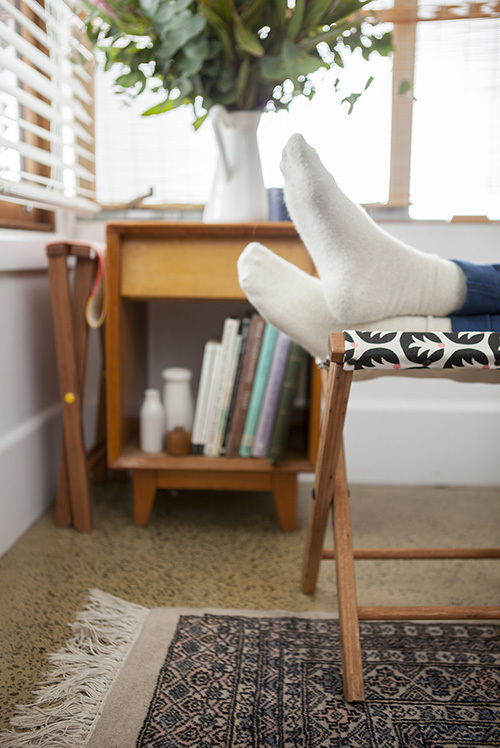 FK chats to Sarah of fabulous Melbourne based label Assembly Design. Debuting at the upcoming Melbourne Markets! Tell us about your label Assembly Design and what the concept is behind it? Assembly Design is all about textiles and objects for the home that are beautiful, steadfast and locally produced with sustainability as a primary focus. The ‘No Great Hurry’ seats are the first cabs off the rank; they are based on the wonderfully simple and much-loved folding stools (made by my Grandpa!) that we had hanging around when we were growing up. 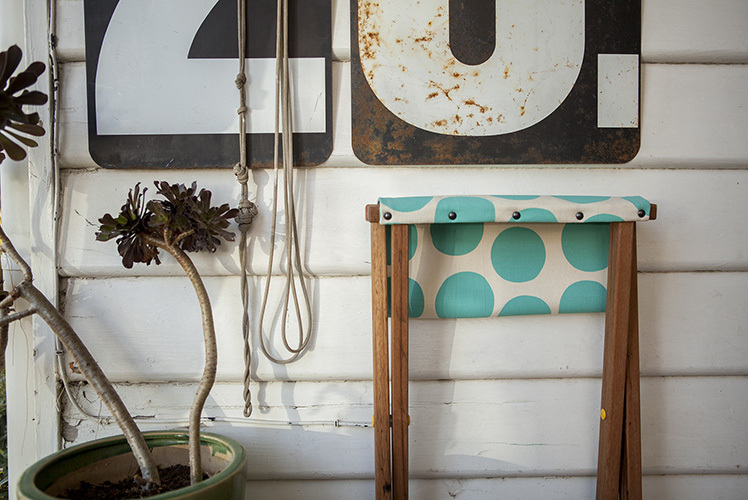 These ones are made in Melbourne from recycled hardwood timber and fitted with canvas seats that are designed by me and screen printed here by hand on organic cotton and hemp fabric. 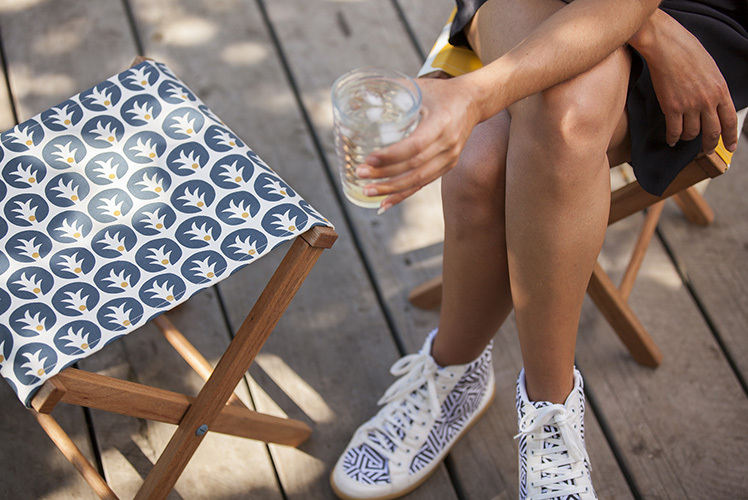 They’re like a fancy camping stool for indoors and out. 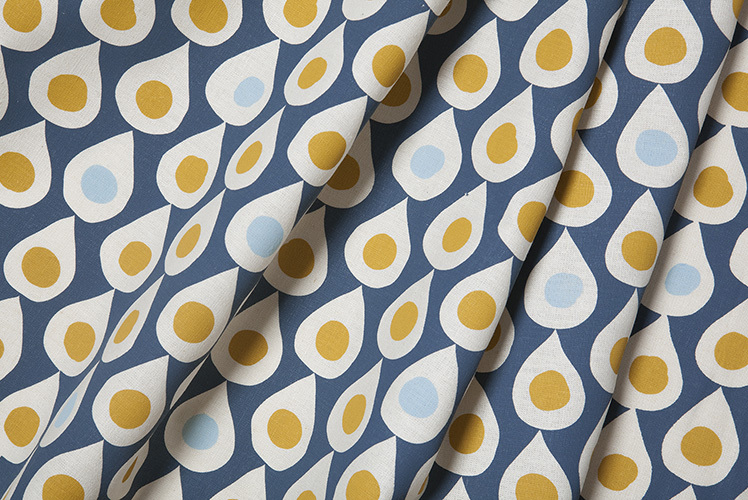 Some of the lovely fabric designs are also available as yardage off the roll on a mid-weight organic cotton/hemp fabric. I suppose I have been angling towards running my own show since I graduated from my degree in textile design a few years ago. I have worked in different areas within the industry, enjoyed the process of designing for other people and learned a huge amount. However the chance to have your own ideas come to life and to see a product or project through from its inception to completion is such a buzz. I majored in screen printing at uni and the process I followed there of designing a print, exposing screens, mixing inks etc and then seeing my idea appear in living colour beneath the squeegee was an excitement and satisfaction I never really got over! In a broader sense, having my own label creates the opportunity to have that experience over and over. If I’m honest I don’t think my style has changed all that much in a long time! The kinds of graphic prints and bright colours that drew me to textile design in the first place are still very much a mark of my own work. I have an appreciation (and often envy!) of so many styles of surface design but when it comes to my own output, the colours and shapes of the 60s and 70s that I have lovingly absorbed tend to keep popping back out. Lots of unlikely little glimpses in every day life can spark ideas but I am often inspired by children’s book illustrations, old fabric designs and advertising prints. There are a couple of different workspaces. I have a desk at a fantastic shared studio space in Carlton, where I do all my design work, research, correspondence etc and have the delight of being able to bounce thoughts and ideas off the creative folk who also work from there. It’s a great social and creative space with lots of giggles, biscuits, ping pong and shared internet clips. My other workplace, following in a long and rich tradition of small businesses before me, is my Mum’s garage. That’s where the hands-on part of the production happens – I prepare the loose timber components (which are machined elsewhere in Melbourne) by sanding and oiling them before assembling them into frames and setting them to dry and bond overnight. Then the canvas pieces are overlocked, hemmed and attached with staples and tacks to the frames. Working down there is a lot more solitary and single-focused than at the studio but I get to listen to the radio and have lots of little visits from Mum and Mabel, her cat. 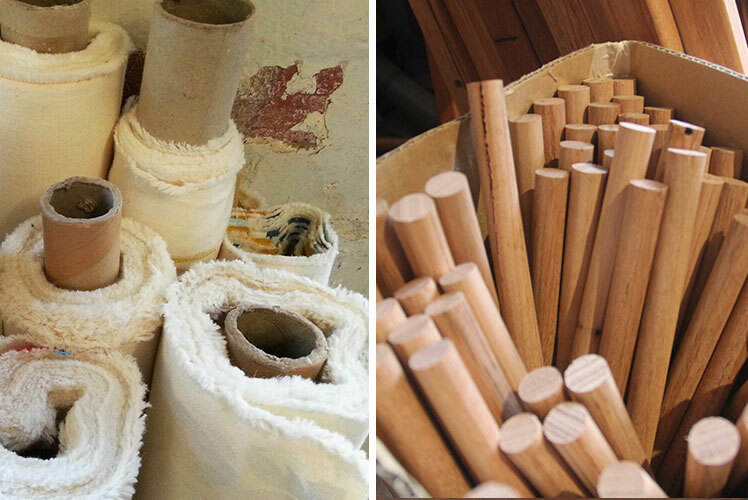 What do you love about working with furniture and textiles? What are some of the challenges? 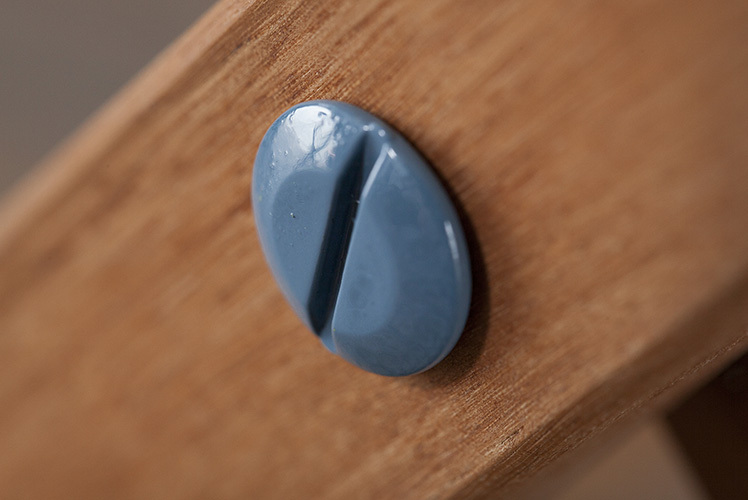 What can we expect to see from Assembly Design at the upcoming Melbourne Markets? 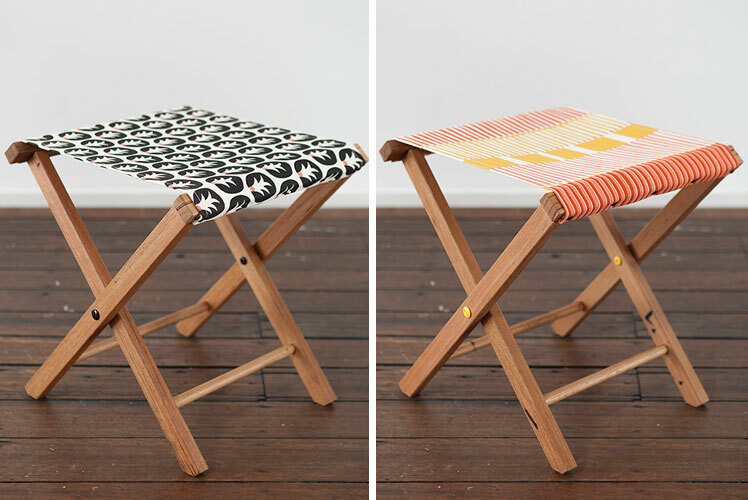 I’ll be at the Finders Keepers Melbourne Market in October with the full range of ‘No Great Hurry’ seats (5 designs, each in two colourways) and some of the Assembly Design fabrics on the roll which can be bought as yardage by the metre. I’m looking forward to it. I love these! Can’t wait to get my hands (and bum) on one!